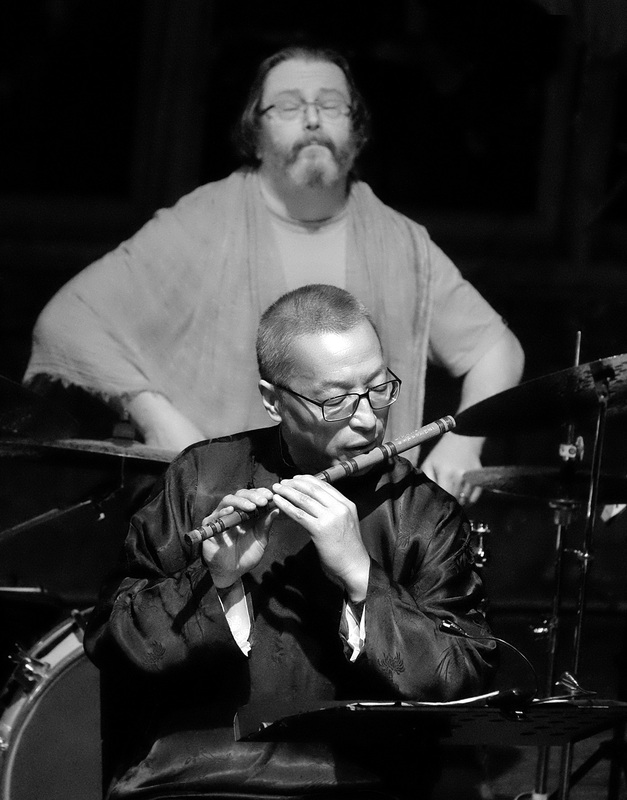 The Kites of Tianjin, Concert 5 in The Usefulness of Art series, fortyfive downstairs, Thursday 26 July, 730pm. Further performances 27, 28 and 29 July. It would be fitting to describe The Kites of Tianjin as breathtaking, yet the reverse is true. The fifth in a series of concerts collectively entitled The Usefulness of Art, first performed at fortyfive downstairs on Thursday night by Adam Simmons Creative Music Ensemble with guest Wang Zheng-Ting on sheng (a polyphonic Chinese mouth-blown free reed instrument), is breathtakingly beautiful. But rather than taking breath away, it fills the audience with life-giving breath. Multi-instrumentalist and composer Simmons has become known in this concert series for creating many moving and energising musical moments, especially at the beginnings and endings of his works. At the end of Concert 2, in August 2017, audience members were drawn to add their voices to the powerful vocals of Pete Lawler to powerful effect. The Kites of Tianjin ending also draws the audience in to share and engage with the ensemble, but in a totally different way. We gradually become aware that the music is becoming breath-like and, in an utterly magic experience, realise as the music fades that all that remains is the breathing. Like gentle waves washing on a sea shore the breathing takes us to an utterly restful and peaceful place. Instead of our breath being taken, we are filled with and enlivened by our own breathing. Inspired by a visit by Ting and Simmons to Shanghai and Tianjin in April, where they meet Wei Guoqiu, who is from a famed kite-making family, The Kites of Tianjin is really all about how wind gives life to kites, as breath does to much music and to us as breathing beings. In composing the work, Simmons does not presume to be able to write Chinese music, but uses notes that are familiar to Ting and yet will allow him to improvise. The result is wonderfully cohesive. Simmons opens the concert with breathy shakuhachi, his notes powerfully pushing skywards in the darkened space, conveying urgency and then calm, seeming to celebrate breath as a life force. The effect of Niko Schauble’s glowering cymbals and delicate brush work, along with slow swells of sound from flutes, is ethereal. Kites by Rachaeldaisy form a colourful backdrop for the performers, who are clad in hues of blue. 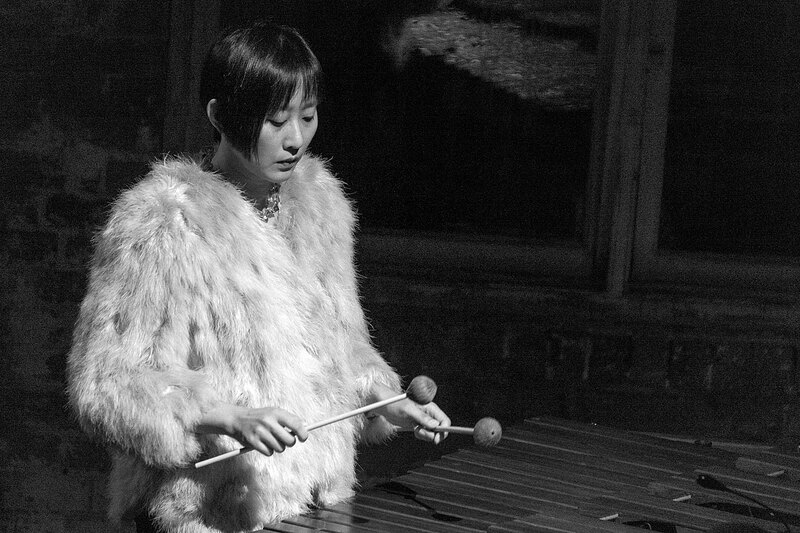 Carmen Chan on her magnificent marimba paves the way for the first sounds from the bamboo pipes of Ting’s sheng, his watery vibrato shimmering then evolving into slow and surreal organ-like chords. This is electrifyingly atmospheric. No concert performed by this ensemble would be without some clutter and clash, but Ting shows he can match it with the drums behind and dancing horns up front in a long percussive piece. This is followed by a lively and melodic period of busyness and bustle with, to me, the feel of a Chinese opera. It could also suggest the frenzied flying of kites in all directions, sharply tugged by a vigorous wind. Eventually the whole band unites to deliver chant-like and almost martial patterns. 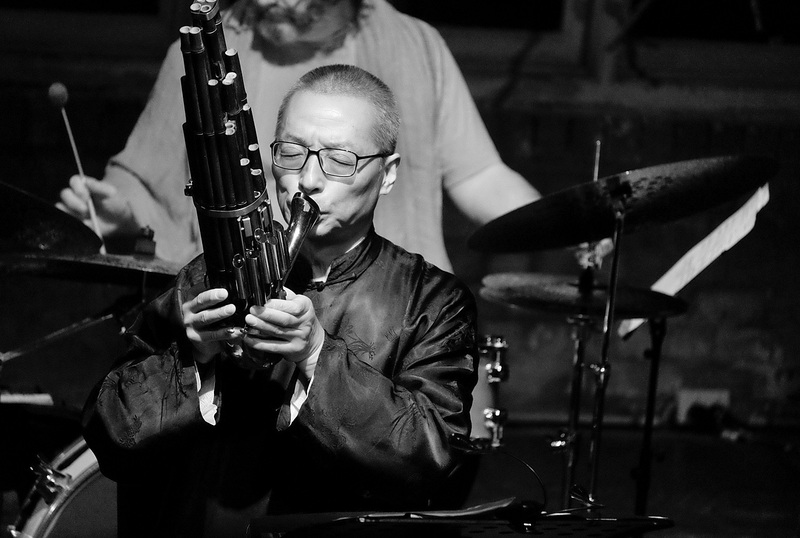 One of many highlights comes when Simmons on tenor sax and Ting on sheng join in a playful and engaging duet, chasing each other’s contributions with notes — Ting’s at times vibrato and at others startlingly high and fragile — that could represent the kites of Wei Guoqiu darting across the sky over Tianjin. The duet draws applause. Marimba and drums open a layered piece that is grounded in complexity and topped with dancing high, agile notes from Ting on a small flute. I love the way the melody rises out of the melee and stray notes seem to fly out of the mix before a sense of unity gradually develops, the horns resplendent over a glorious mayhem of percussion before it all dies away in a weirdly evocative chatter. At one point Gideon Brazil and Gemma Horbury fly small hand kites around the stage, but they are not often caught by the light. Penultimately, Schauble’s cymbal rumble and Nat Grant on glockenspiel, backed by Howard Cairns on bowed bass, usher in Ting back on sheng for an interlude I could listen to forever, it is so fragile, peaceful and floating on air. Flutes join in, well spaced, as the music takes us seamlessly into the final breath-filling finale. The Kites of Tianjin seems short at not quite an hour, and less of a journey than the previous concert, The Calling. It has much complexity at times and yet the overall effect is conveyed with potent simplicity. We breathe. We live. Don’t miss the chance to hear this concert. This entry was posted in ARTICLES and tagged 2018, Adam Simmons, Adam Simmons Creative Music Ensemble, Carmen Chan, fortyfivedownstairs, Howard Cairns, July, Nat Grant, Wang Zheng Ting. Bookmark the permalink.